USAID Mission Director Reed Aeschliman with senior officials from Sampath Bank and Hatton National Bank. The U.S. Agency for International Development (USAID), the USAID Development Credit Authority (DCA), Hatton National Bank and Sampath Bank have announced a new partnership for a programme of up to US$ 9 million for local financing available to private, micro-, small-, and medium-sized enterprises (MSMEs) throughout Sri Lanka. This seven-year programme will help to address the current lack of financing to these key borrower groups. 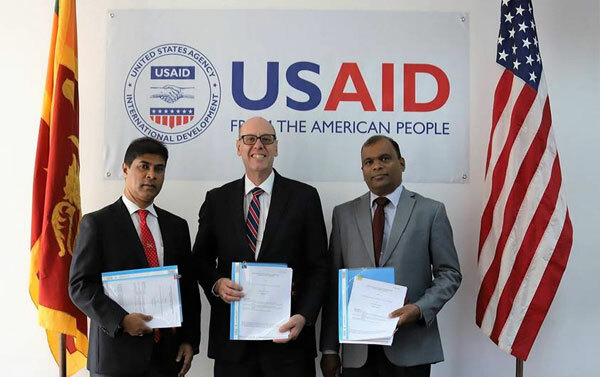 This partnership will complement and be further supported by USAID's YouLead programme that strengthens employability and self-employment opportunities for youth in Sri Lanka, the US Embassy stated in a press release. The signing of this agreement, which took place on September 5in Colombo, reaffirms United States' commitment to Sri Lanka's economic development and is part of broader and ongoing USAID support for Sri Lanka. “We at USAID are proud to encourage private sector lending in key sectors that are vital to the economic development of Sri Lanka,” said Reed Aeschliman, Mission Director for USAID Sri Lanka. The programme represents a crucial step toward enabling Sri Lanka's private sector and youth entrepreneurs to access capital, expand businesses, and ultimately, to create more jobs. The agreement will unlock critical resources that will help spur innovation, foster investment and provide critical resources to under-served segments of Sri Lanka's economy including existing MSMEs and start-ups, the release stated. “Given HNB’s extended legacy of facilitating growth and development in the MSME sector, we are conscious of the immense potential and vital need for access to finance. Today’s partnership between HNB, USAID and Sampath Bank represents a vital step forward in our collective mission in enhancing economic opportunities for young Sri Lankans,” said Jude Fernando, HNB Deputy General Manager – SME and Mid-Market. HNB and Sampath Banks' strategies align well with the purpose of this partnership. Both banks have extensive outreach and experience and are well positioned and committed to increasing MSMEs and start-up lending. “We at Sampath Bank believe in entrepreneurship development at all levels and development finance has been a major area of lending for us. As such, we welcome this scheme which will provide better access to much-required capital for the new entrepreneurs and it aligns well with our own entrepreneurship development initiative,” said Tharaka Ranwala, Senior Deputy Managing Director of Sampath Bank. USAID's DCA works with investors, local financial institutions, and development organisations to design and deliver investment alternatives to mobilize local financing for U.S. Government priorities. To date, the DCA has helped mobilize up to US $5.4 billion in private capital in 76 countries across 558 projects. USAID is the development agency of the U.S. Government. USAID has provided development and humanitarian assistance to developing countries worldwide for over 50 years. In Sri Lanka, the U.S. Government has invested more than Rs. 320 billion (two billion US dollars) to benefit its people since 1956.